Out of curiosity, why don't you package the x64 version or at least have a downloadable package for it instead of requiring folks to pull and build it? The link above points to the binary builds, you just download and unpack it into IDEA_HOME/jre64 folder. 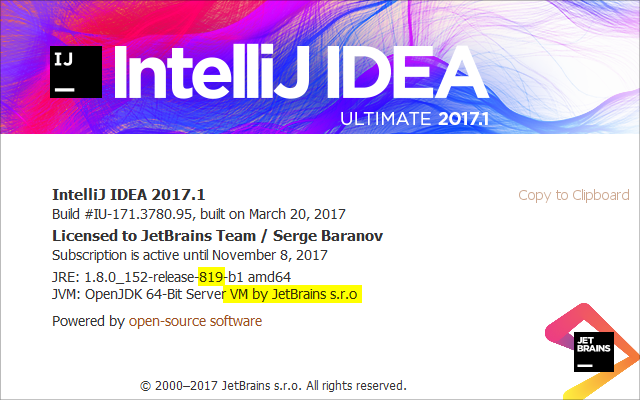 For example, here is the link to the current Windows version of the custom 64-bit JDK: https://bintray.com/jetbrains/intellij-jdk/download_file?file_path=jbsdk8u76b218_windows_x64.tar.gz. We don't package it by default to save size of the distribution since for the most users 32-bit version will work just fine. 64-bit version is needed only in case you need to use heap sizes higher than 1GB (when working with large projects or many projects at the same time). 64-bit version has more RAM overhead. Bundling both versions would make the download size much larger, bundling only 64-bit version will make it unusable for users on 32-bit systems. and ended up wandering into the GitHub page and thinking there was no download from there. Oddly confusing UI, IMO. Thanks. BTW, it would be nice to at least make it an optional "would you like to download and install our 64-bit JRE" in the installer. Then folks could decide if they needed it. I've added a request at https://youtrack.jetbrains.com/issue/IDEA-158522. Feel free to vote. Either this is no longer true, or I'm missing something about JDK/JRE differences. "JDK is bundled with all the product installers and it's recommended that you will use the provided JDK version unless there are any specific issues. 32-bit JDK is located in IDE_HOME\jre directory and is used by the 32-bit product executable." Yes, the wording is confusing, and what we bundle it's technically a Runtime that can be used only for running the IDE, not as a project JDK. It's also not a JRE since JRE doesn't include tools.jar that is required to run IntelliJ IDEA. JRE 1.8 is bundled with distributions for all platforms. You don't need any Java to be installed on your machine in order to run IntelliJ IDEA. JDK is not required for developing Web, PHP, Ruby or Python projects in IntelliJ IDEA. The standalone JDK installation is required for Java development only. However, you CANNOT use our bundled JRE for Java development. How to correct an error? Gradle sync failed: The newly created daemon process has a different context than expected. What value at the JAVA_HOME variable? What error do you get? Please contact support with more details. The troubleshooting instructions for Windows includes the following statement: "To run the IDE in 64-bit mode you will need to download and install 64-bit JDK (not JRE) distribution and install it yourself." I do not understand why IntelliJ needs the JDK to "RUN" on windows; I would think an updated JRE sufficient. Presumably, it would be wise to compile software with an updated JDK, so in that respect inclusion of an updated JDK with the IntelliJ installer would be prudent. On a second point, am I correct in inferring that the JDK bundled with IntelliJ is that for a 32 bit computer? And that if the computer on which IntelliJ is to be installed is a 64 bit computer, then one must download and install the 64 bit JDK. These days aren't most computers (even laptops) 64 bit? Why not bundle both the 32 and 64 bit JDKs with IntelliJ? At the very least, why not bundle the most commonly used JDK (64 bit) with IntelliJ? > I do not understand why IntelliJ needs the JDK to "RUN" on windows; I would think an updated JRE sufficient. IntelliJ IDEA uses compiler APIs which are not available in JRE, therefore it needs JDK to run. > On a second point, am I correct in inferring that the JDK bundled with IntelliJ is that for a 32 bit computer? No, it works on both 32-bit and 64-bit. > And that if the computer on which IntelliJ is to be installed is a 64 bit computer, then one must download and install the 64 bit JDK. No, it works out of the box. Also, 64-bit JDK is default since 2017.1 version and 32-bit JDK is downloaded by the installer (optional). > These days aren't most computers (even laptops) 64 bit? Why not bundle both the 32 and 64 bit JDKs with IntelliJ? See above. 64-bit is default now, 32-bit is an optional download to save size of the installer on Windows. > At the very least, why not bundle the most commonly used JDK (64 bit) with IntelliJ? It's bundled since 2017.1 release. The path given above, idea.config.path\<product>.jdk, seems to be wrong with the current products. At least the location was empty, and I found the JDKs installed under .WebStorm2017.1/config/jdks. No, you are mixing up the location of the JDK itself and the location of the text .jdk file that overrides the default JDK. @Serge, thanks for that. You are indeed correct. The problem was just that this file never gets created, which made me search for alternative locations. As you can see from the Version string on the Directory name, I should be running 1.8u152, but the internal strings says it is version 1.8u76. That also makes WebStorm complain about using an old Version. What Java version is displayed in About dialog? What's the output from "~/.WebStorm2017.1/config/jdks/jbsdk8u152b845.3_linux_x86/bin/java -version" command? Thank you, I've reported a bug: https://youtrack.jetbrains.com/issue/JRE-342. My installation of IntelliJ IDEA Community Edition 2017.2.5 in Linux does not have the idea.jdk file in ~/.IdeaIC2017.2 this page is talking about. That is the expected behavior, this file is created only if you have customized the runtime. On this older machine, I'm running IntelliJ IDEA 2017.2.5 Build #IU-172.4343.14, on Windows 7 Pro 64 bit. I originally installed that IDEA update without its own JDK, or so I thought, and IDEA has been complaining ever since that "IDE's Java runtime (1.8u102) is outdated - this may cause stability issues. Please update to 1.8.0u112 or newer". Tonight I updated Java on the machine itself to jre1.8.0_151, but IDEA still gives the same alert about 1.8u102. The first option suggested here that I tried was Find Action "Get JB SDK", which finds nothing. 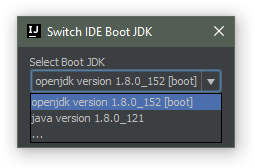 Second was Find Action "Switch IDE boot JDK", which does find that action, and offers two options. 1.8.0_102 (b14) boot, and 1.8.0_152 openjdk (release -915-b12) [bundled]. 1.8.0_102 is selected initially. When I choose 1.8.0_152 and click OK, IDEA reboots, but nothing has changed, the out of date java warning is still there, and opening that action dlg shows 1.8.0_102 as the boot JDK, still. I tried running IDEA as admin, in case it wasn't able to record that setting for some reason, no difference. You probably have an environment variable set which overrides the default runtime and has the priority over the config file which is changed via UI, hence the behavior you are describing. Thank you Serge, you were right, removed the IDEA_JDK_64 key, restarted IDEA, it's happy. Does IDEA create that key under some circumstances? I don't remember for certain, but it seems unlikely I would have done that myself. What's happening with Find Action "Get JB SDK"? Is the info about that on this page out of date? IntelliJ IDEA never sets any environment variables, it can be done only manually by the user. Double check the plug-in is installed and enabled: http://www.jetbrains.com/idea/webhelp/enabling-and-disabling-plugins.html. My apologies, plugin was disabled, all good. Thank you. Following upgrade to 2017.3, when I try to download a new sdk using the bintray plugin, the download seems to fail. The install button does not become clickable and I cannot find the .tar.gz file on my system. Check the logs for details. 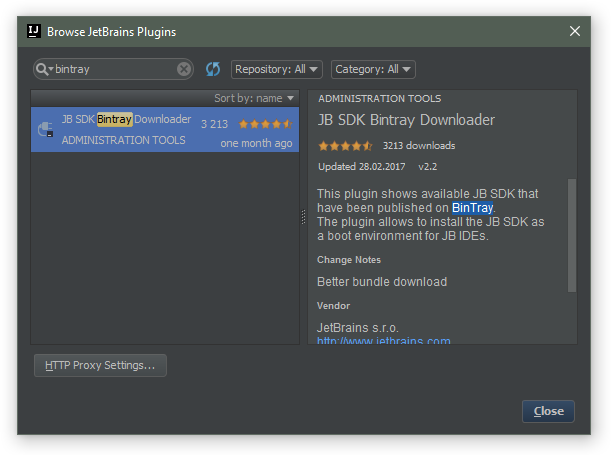 Bintray servers are not hosted by JetBrains.